Have you all heard of airbnb? I had not until today. 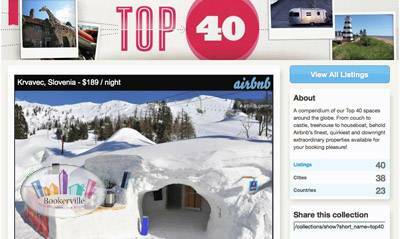 It's a vacation rental listing site, but what caught my eye was their Top 40 list of spaces. They describe it as the following: "A compendium of our Top 40 spaces around the globe. From couch to castle, treehouse to houseboat, behold Airbnb's finest, quirkiest and downright extraordinary properties available for your booking pleasure!" Take a look at some of the spaces! Very neat. Isn't it amazing what a great photo can do along with a unique location, feature, or even great interior design? Now, I know most vacation rentals are NOT actually castles, built into the side of a mountain, up in a tree, or made to look like a shoe. But, it just makes me think what one can do to their vacation rental to make it stand out a little, to make guests go "ooooooh that's cool/cute/heavenly!" What do you do to make your vacation rental stand out from the crowd? Nice article, thanks for the tip! Airbnb is not cheap! 3% of my annual rental gross is $2700 plus they also charge the renter a service fee!